Well, of course, many of us do know why she explored the themes she did in puritanical late-nineteenth century America, and we admire her for doing so. LOA explains that while her stories were usually sought after, some were a little too hot to handle. “Fedora” was one such, being “turned down by the national magazines that often competed for her work”, only appearing “in an upstart literary journal in her hometown of St. Louis”. The young people—her brothers’ and sisters’ guests, who were constantly coming and going that summer—occupied her to a great extent, but failed to interest her. She concerned herself with their comforts—in the absence of her mother—looked after their health and well-being; contrived for their amusements, in which she never joined. And, as Fedora was tall and slim, and carried her head loftily, and wore eye-glasses and a severe expression, some of them—the silliest—felt as if she were a hundred years old. Young Malthers thought she was about forty. Fedora had too early in life formed an ideal and treasured it. By this ideal she had measured such male beings as had hitherto challenged her attention, and needless to say she had found them wanting. She sought him out; she selected him when occasion permitted. She wanted him by her, though his nearness troubled her. There was uneasiness, restlessness, expectation when he was not there within sight or sound. There was redoubled uneasiness when he was by—there was inward revolt, astonishment, rapture, self-contumely; a swift, fierce encounter betwixt thought and feeling. Fedora could hardly explain to her own satisfaction why she wanted to go herself to the station for young Malthers’ sister. She felt a desire to see the girl, to be near her; as unaccountable, when she tried to analyze it, as the impulse which drove her, and to which she often yielded, to touch his hat, hanging with others upon the hall pegs, when she passed it by. It seems, then, that she is in love with him, as the original title encourages us to think – or that she, at least, feels a desire or passion for him. So, when she picks up Miss Malthers, why does she do what she does? That is the question – and it’s one I’m not going to answer, because that would be a spoiler and because the story is so short that you can read it, and ponder it, yourself. And anyhow, I’m still thinking about it myself, given the way Chopin teases us. Suffice it to say that, however you read it, Chopin was challenging her readers to think about desire – its origins, its expression, and its impact on the person who desires. This is a beautiful and intriguing little “sketch”, though to call it that doesn’t fully do it justice. Note: My other Kate Chopin reviews are A pair of silk stockings, After the winter, A respectable woman, Désirée’s baby and Morning walk. My, they are building up aren’t they? I read and enjoyed it, so thank you for the link. The ending is both sudden and unexpected, I wonder what Chopin intended, perhaps that Fedora was behaving with the sister as she couldn’t with the brother, or perhaps, and this is my view, that Fedora was happy and overcome. Great story. Great ending. Now I’ll have to read her other stories. You are certainly adding variety to my reading. Oh, I love that Neil, re adding variety to your reading. I hope enjoyably so. I guess you are still in hospital? Came out on Friday, now recovering from hospital. Taking a while to get my energy back. Great to hear Neil… Much nicer to be out.hope your energy doesn’t stay AWOL for too long. I haven’t read this one, Gummie, so I should see if I can find it. It’s not in the collection I have. Hi Guy… I provided a link at the end of my post… I always do that for LOA stories. I don’t like reading much on the computer–don’t mind short things however. Ever tempted to try a novel from Chopin? Oh Guy. It’s only three pages and I printed it out. I always print out the LOA stories. I need to scribble on them for a start! (But now I have folders and folders of printed out short stories, and I think I really should start decluttering them). And yes, I’ve read The awakening, twice – and liked it a lot. Can you recommend others? Oh yes, I have that too! 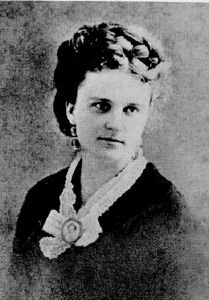 Kate Chopin the brave pioneer of realist fiction in the USA. It seems such a shame that Willa Cather was so down on her work. Yes, I was a little surprised by that Ian given Cather’s own work – though she didn’t deal, I guess, with those more “controversial” topics. At least she recognised Chopin’s fine style! Chopin is so good at endings in my opinion, especially ones that leave you thinking. Yes, she is, I agree Stefanie… One of the reasons I really like her too. They’re not tricksy in the sense that you can’t work them out but provocative in that they leave you thinking and wondering about the possibilities. It would be a lovely reading project to go through one’s shelf/notebook to identify the primary works from classic women writers, like The Awakening, and then make a point of reading beyond them. Even with my fondness for some of the reprinting imprints, I still tend to think first of the recognizable and famous, whereas there are obviously plenty of gems below the surface. Like this one. Yes, totally agree on that Buried, the challenge is finding the time to delve deeper isn’t it?